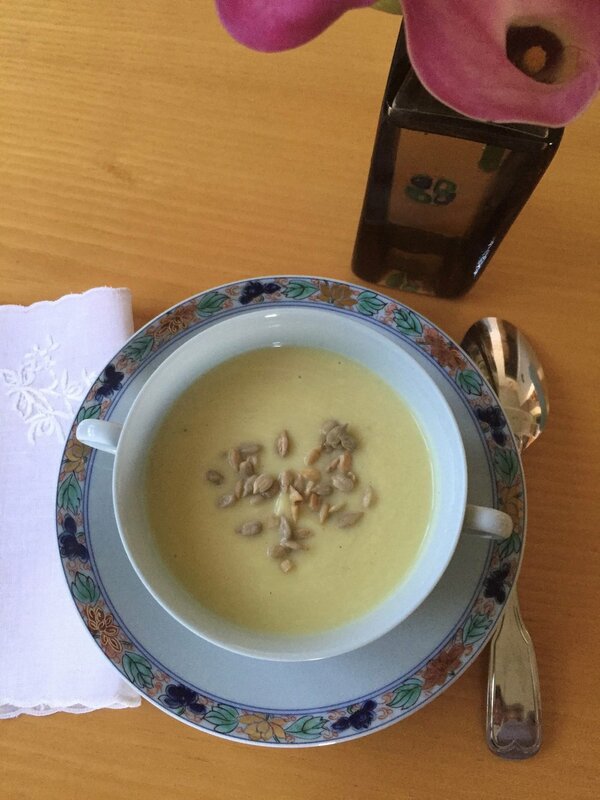 I tend to serve this creamy, flavorful soup all year round. It is light enough to whet the appetite. Cut off and discard the dangling roots and most of the green part of the leeks. Discard one or two of the tough outer leaves. Cut the white and light green parts into slices. Place in a sieve and rinse thoroughly under cold running water to remove any sand, drain well. Peel the garlic and cut into quarters. Cut off the green leaves of the cauliflower and discard. Cut and discard all but ¼ inch of the heavy stem. Cut the stem and the head into small pieces and rinse. Heat the olive oil in a large saucepan. Add the leeks and the garlic. Sauté, covered, over low heat for 5 minutes. Add the cauliflower, 4 cups of the broth and the curry powder. Bring to a boil over high heat. Lower the heat and cook, covered, for about 20 minutes or until cauliflower is soft. Puree the soup, in batches, in a Vitamix until very smooth. Adjust the consistency with the reserved broth and season to taste with curry powder, salt and pepper. Garnish with toasted sunflower seeds.